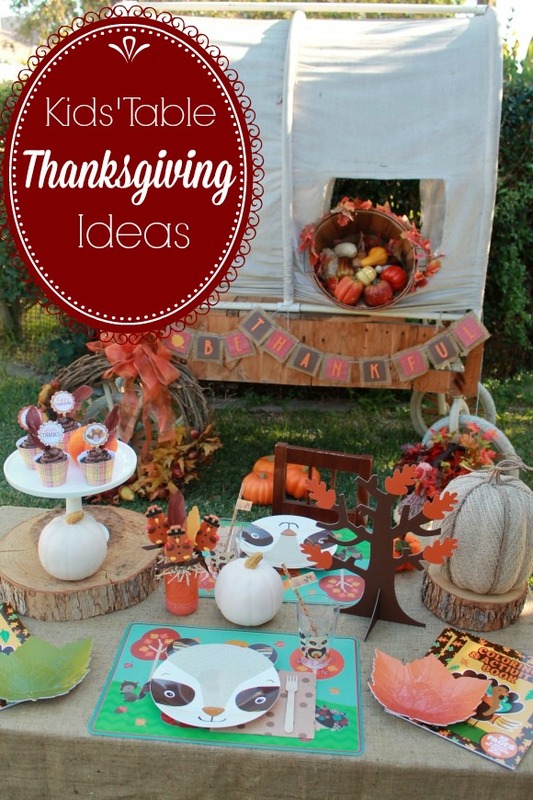 Today we have some fun, last-minute Thanksgiving kids' table ideas from Laura Aguirre from Laura's Little Party! Thanksgiving is one of our favorite holidays! We love the time that is spent with family. And this year, our family has grown. So if your family is big like ours, and you're thinking about setting up a kid’s table, here is some inspiration to get you started! Make sure you save a designated area for the kiddies: This could be a small area in your dining room, or even a spot outside. Here in California, we end up doing a lot of outdoor dining, even in November. 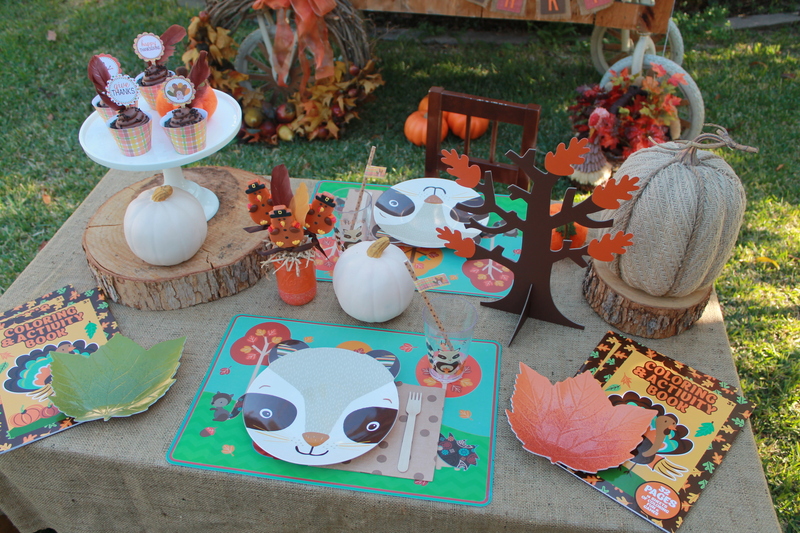 Make your kid tablescape fun & inviting: You can add a placemat that has games & coloring options. Or you can set out a few coloring books for each guest. I also made sure their table had easy access to cupcakes & turkey shaped suckers. I found the suckers at Tai Pan Trading. 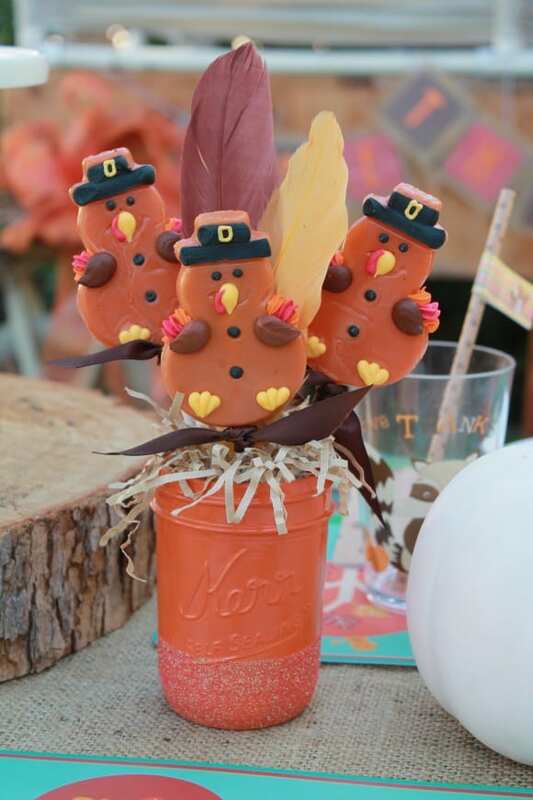 They were displayed in a darling mason jar from Just Add Glitter. Marla creates such beautiful jars - I love using them in all of my parties! Set out smaller & easy to handle cups & dishes: There are lots of kid-friendly dining options, and cute plates are one of them! I scooped up these plastic raccoon shaped plates, and matching cups from Walmart. The placemat is from Hobby Lobby. 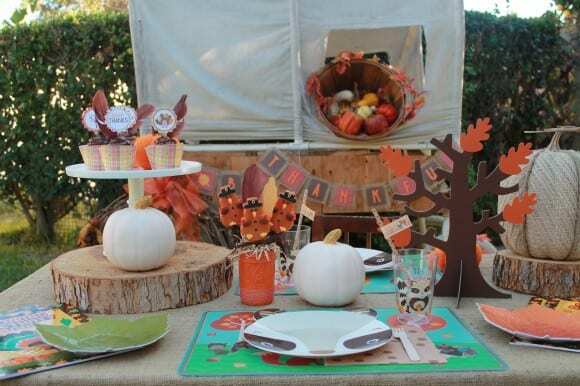 My no-fuss table cover was nothing more than a couple yards of burlap that I found at JoAnn Fabrics. 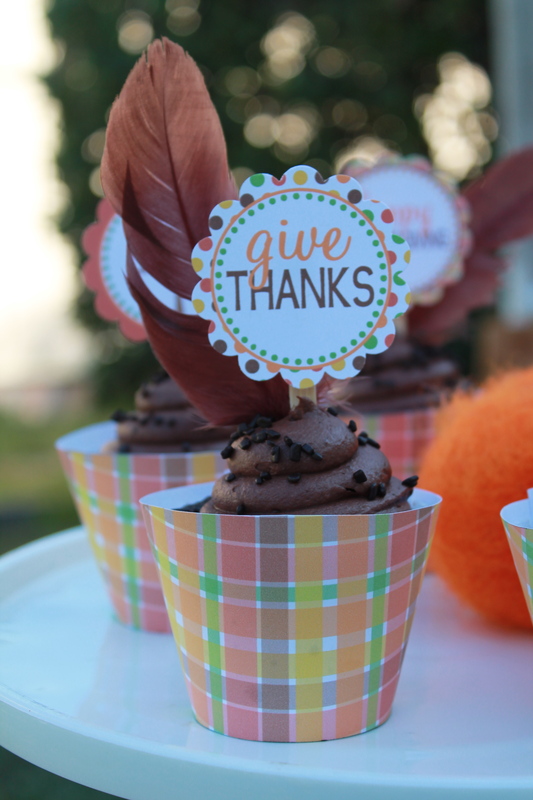 Embellish a few things with festive printables: I came across a darling Thanksgiving themed printable set from DimplePrints. They were offering a huge printable set as a free download on their site. Lots of fun items to choose from! I added the circle toppers to our cupcakes, and wrapped them with their printable wraps. 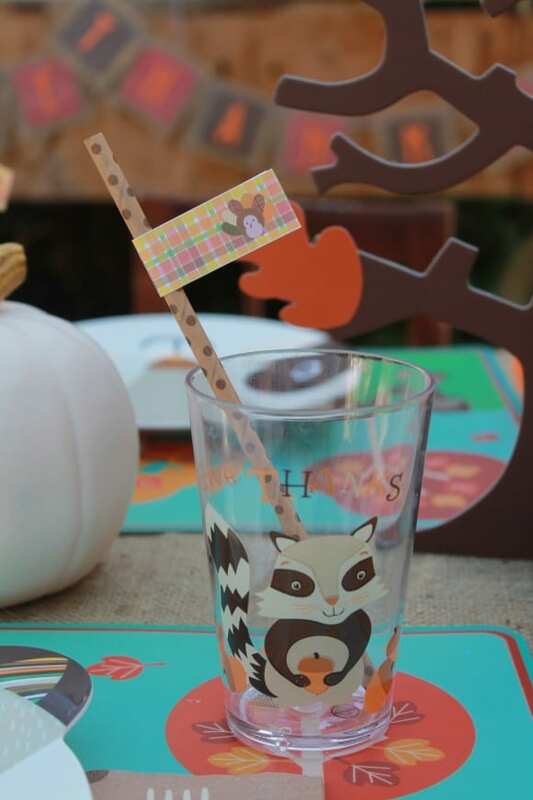 The turkey straw flags were a hit on the polka dotted straws from Target. In addition to the kid’s table that was filled with treats & coloring books, we brought out our mini covered wagon! 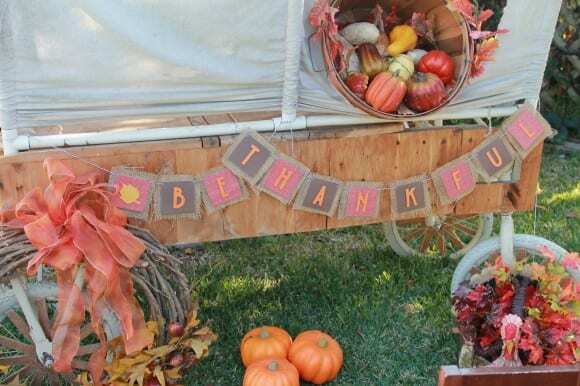 I added a bushel of fake vegetables, a fall wreath, and a gorgeous ‘Be Thankful’ banner. The banner is beautifully hand crafted with burlap, and festive die cut pieces. Rina from Mothership Scrapbook Gal did a fantastic job on it! Not only will the covered wagon serve as a neat backdrop for our little guests’ area, but the kids will have a blast playing inside, and letting their imaginations soar. 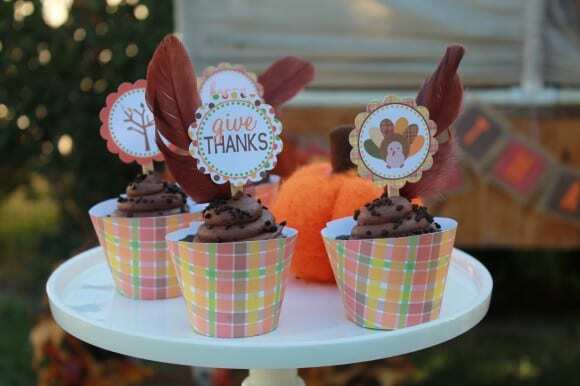 And when you mix imaginations, kids, family, and great food, you’ve created a recipe for a memorable event! It doesn't get much better than that! Wishing you & your family a very Happy Thanksgiving! To learn more about Laura, find her at Laura's Little Party and on Facebook and Pinterest.